Havana release is scheduled on the 17th of October. In just a few hours the new version of OpenStack will be ready. As we did for other releases, we at Bitergia have prepared the Havana development dashboard for showing and exploring the main development parameters of the project during this cycle. The first headline that becomes apparent by browsing it is that during these last six months, the OpenStack community has experienced the most active period in their history, and still keeps growing and growing. Havana may well be titled as the 900-developers-release. In approximately six months of work, between the 4th of April till the 17th of October, this community has been able to receive contributions from 900 different people, affiliated to more than 150 organizations. And we are only talking about the source code activity. However, the comparison with previous releases is still more interesting. The analysis considers 62 git (source code) repositories, those considered as the official OpenStack Programs. Along the whole history of the project, more than 47,000 commits (changes to source code) have taken place (ignoring merges and bot activity). The Havana release was responsible for about 28% of that activity. This number is by far larger than a couple of years ago, where the Essex release was responsible for about 4,000 commits, representing around 8.5% of the total activity up to now. 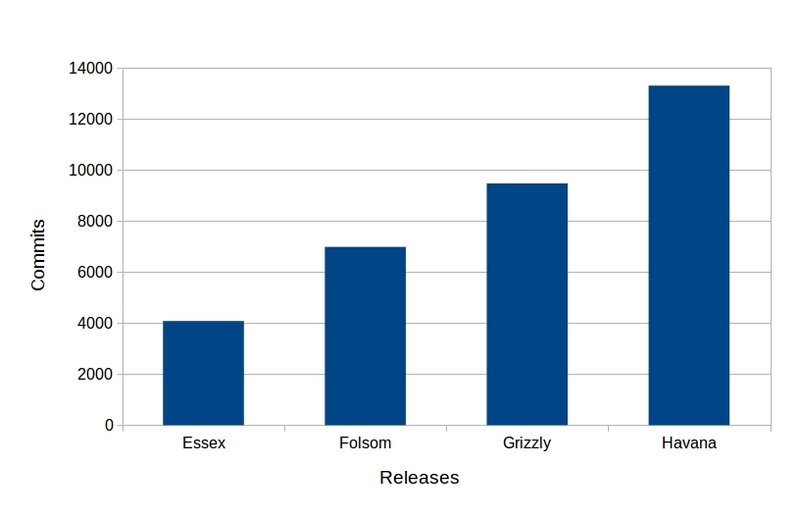 Folsom reached a total of 6,980 commits and Grizzly was close to 9,500. A similar history can be told for the number of developers that at some point submitted at least one change to the source code. More than 1,400 developers have participated already in the source code activity. Of those, 923 have contributed to Havana. 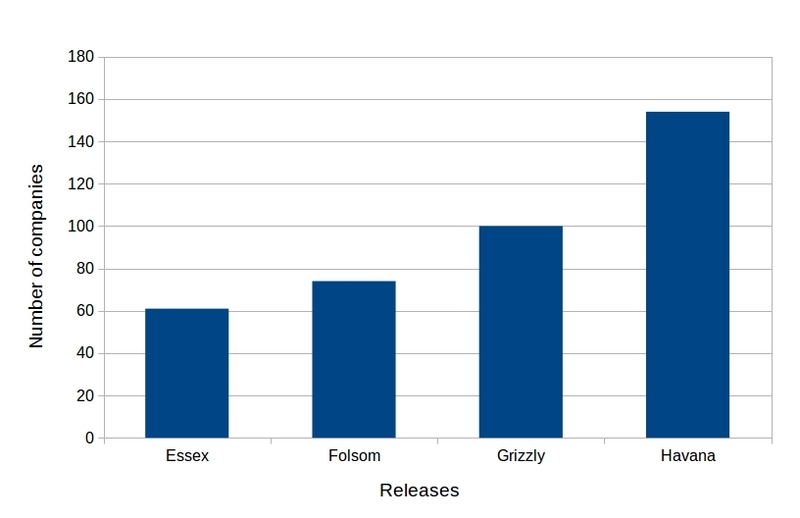 Again, two years ago, about 250 developers contributed during the Essex release cycle. For Folsom they were 369 and for Grizzly close to 600. More details can be found in Figure 2, where the number of authors per release is provided. 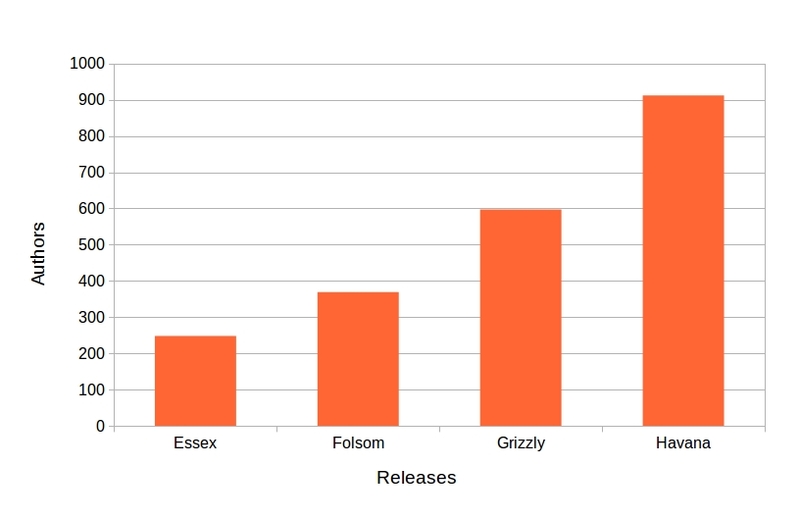 If those numbers between each pair of releases are compared, the big jump in terms of activity took place between Essex and Folsom, while Grizzly and Havana have been the releases for which the product became more and more popular, with a higher attraction of developers to the community. 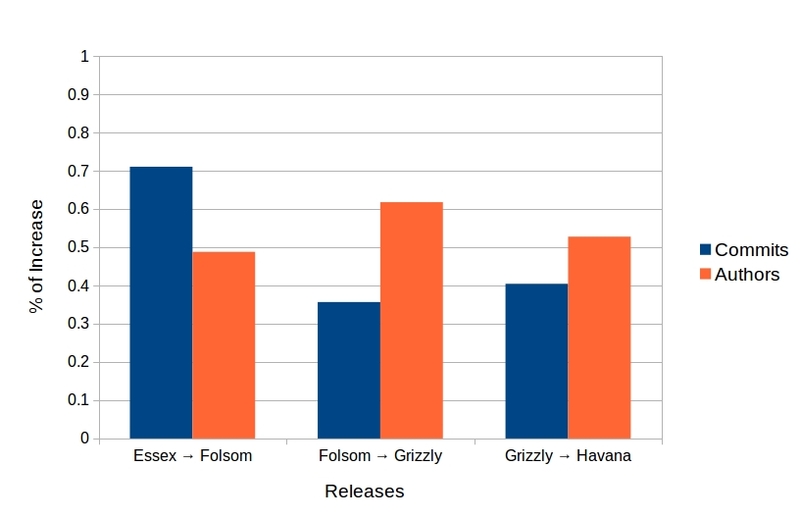 The Havana release represents an increase of 40% over the activity in Grizzly, and more than 50% in the number of people that contributed to the source code. This behavior is also extensible to the ecosystem of organizations. In Essex 61 different organizations were detected as being part of the development source code activity, while in Folsom 74 were developing. Grizzly was the release when OpenStack reached 100, and Havana has skyrocketed to more than 150 contributing organizations. In fact, the OpenStack Foundation has been quite successful attracting new organizations to its ecosystem during the last releases. The increase in percentage from Essex to Folsom is around 21%. The increase between Folsom and Havana is close to 35% of new organizations coming to the project. But the richest step is found between Grizzly and Havana where that increase reaches 54%.